An inscription Fiat iustitia pereat mundus on the sculpture The Scales of Justice in Kolín. The sculptures was made by Ivan Erben in 2001. 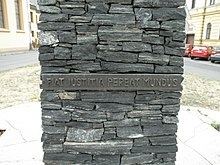 Fiat iustitia, et pereat mundus is a Latin phrase, meaning "Let justice be done, though the world perish". This sentence was the motto of Ferdinand I, Holy Roman Emperor, probably originating from Johannes Jacobus Manlius's book Loci Communes (1563). It characterizes an attitude, which wants to provide justice at any price. Its first documented use in English literature was about half a century later. A famous use is by Immanuel Kant, in his 1795 Perpetual Peace: A Philosophical Sketch (Zum ewigen Frieden. Ein philosophischer Entwurf), to summarize the counter-utilitarian nature of his moral philosophy, in the form Fiat justitia, pereat mundus, which he paraphrases as "Let justice reign even if all the rascals in the world should perish from it." Ludwig von Mises created a variation on the phrase more in keeping with his philosophy: Fiat justitia, ne pereat mundus ("Let justice be done lest the world perish"). This phrase (in the form Fiat justitia piriat mundus) is inscribed on the side of John Constantine's lighter in the 2005 film Constantine (based on the Vertigo comic book series Hellblazer and starring Keanu Reeves). ^ "imperium-romanum.com - Relikte - Sentenzen". Retrieved 19 September 2014. ^ "Fiat iustitia, et pereat mundus". Retrieved 19 September 2014. ^ "Perpetual Peace: A Philosophical Sketch: Appendix 1". Retrieved 19 September 2014. ^ Project for a Perpetual Peace, p. 61. Retrieved 19 September 2014. ^ Immanuel Kant's Werke, revidirte Gesammtausg, p. 456. Retrieved 19 September 2014. ^ Mises, Ludwig von (1962). Socialism: An Economic and Sociological Analysis (PDF). The United States of America: NEW HAVEN YALE UNIVERSITY PRESS. p. 400. ISBN 978-1-933550-51-0. ^ Magical Holy Relics. Constantine Movie Extras on YouTube. This page was last edited on 7 March 2019, at 14:30 (UTC).